25,939 students from nearly 700 schools participated in the 2018 National German Exam. View 2018 Exam at a Glance. The Exam, now in its 58th year, provides a means of comparing students in all regions of the country, provides individual and programmatic diagnostic feedback, and rewards students through an extensive prize program. The exam is comprised of two parts with a total of 100 multiple choice questions. The listening and viewing portion is 40 minutes in length and consisted of a series of short audio and video segments with a total of 50 questions and tasks. The reading portion was 45 minutes in length and consisted of a number of print texts, including graphs and images with a total of 50 questions and tasks. All materials used in the exam are from authentic resources. 5,445 students participated in the 2018 Level 1 Exam. 8,712 Level 2 exams were administered, 6,986 students took the Level 3 exam, and 4,796 students took the Level 4 exam. Students enrolled in public schools continue to account for over 81% of all exams. 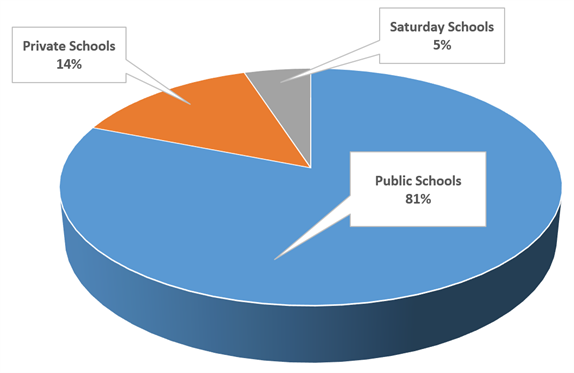 Private schools took 14% of the exams and students enrolled in Saturday schools accounted for 5% of the total exam volume. The chart below shows mean scores for each section of the exam as well as the total exam. The Standard Group is comprised of students who responded “no” to the survey question, “Is German spoken regularly in your home?” Students are instructed to answer YES if German is used to communicate in their home. If their knowledge of German comes only from German classes taught in US schools, they are instructed to answer NO.